Now made ubiquitous by the spread of Asian cuisine, chopsticks have been the dining utensil of choice in China, Korea, Japan, and Vietnam for thousands of years. As a part of the local culture, chopsticks are dipped in various legends and folk customs. One popular tale holds that chopsticks were invented by the legendary Chinese Emperor Yu the Great, during a time when civilization was threatened by massive floods. Too busy with work on the innovative system of dikes that would control the waters, Yu couldn’t spare time to see his wife and children, let alone sit down to have a decent meal. Once, when his labors brought him to an island, Yu set up a pot and fire to cook meat. Anxious to fill his stomach and get back to the task at hand rather than wait for the pot to cool, he snapped a couple twigs from a tree branch and picked the meat directly from the boiling oily water. His followers imitated him, and the chopstick was born. The earliest confirmed chopsticks were a metal pair unearthed from a Shang Dynasty (circa 1600–1046 B.C.) archaeological site, the Ruins of Yin. Eating with chopsticks gradually became commonplace. Cutting food before serving conserved fuel (as smaller pieces can be cooked faster) and eliminated the need for table knives, which were considered barbarian. Physically, chopsticks demonstrate elements of Chinese philosophy, notably the yin-yang binary. The two chopsticks must be used as a pair, with one held firm while the other moves, to be of utility. This reflects the understanding of yin and yang as respectively passive and active elements that form the concept of a dynamic whole. A common style of chopstick has round and square ends, reflecting heaven, which is depicted as circular in Chinese thought, and earth, which is represented by square shapes. This has its origin in the eight trigrams, a set of principles used for divination. The fingers, situated in the middle, stand for humanity, which is nourished by heaven and earth. Because they signify the union of heaven and earth, chopsticks are seen as auspicious, and are often included as wedding dowries to bless newlyweds. Traditionally, the standard length of a chopstick was measured as seven Chinese cun (about an inch) and six fen (around a centimeter). This is believed to represent the Seven Sentiments and Six Desires described in Buddhist theology. 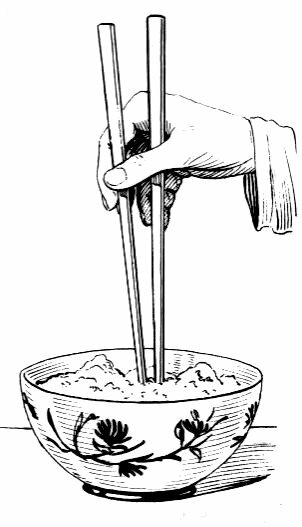 When holding chopsticks in proper fashion, the fingers naturally assume three positions, with the thumb and index fingers on top and the ring and little fingers below. The middle finger is situated between the two sticks. In sum, this symbolizes the traditional Chinese axiom of heaven, earth, and humankind. The ring and little fingers, supporting each other below the lower chopstick, represent the Dao of earth, or the cooperation of people living in the mortal realm. The index finger and thumb represent flexibility and stability, or heavenly laws. The middle finger symbolizes the difficult but honorable position of the monarch, traditionally called the son of heaven, who must simultaneously address the needs of the people while abiding by virtue and law. The ancient Chinese believed that there existed bonds between heaven and mankind. Such beliefs permeated culture and life, from religious rituals held in imperial court to folk customs passed down from age to age among the people. Faith in heaven was demonstrated through the nobility’s observance of rites; for commoners, trust manifested itself as etiquette and filial piety.